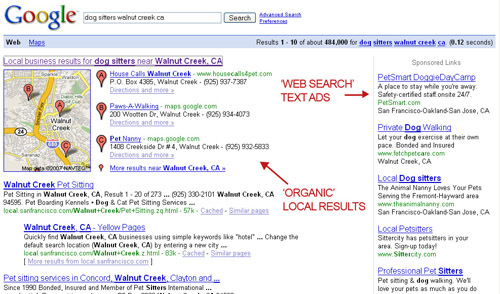 Home > Most recent SEO articles > What is Google local search algorithm? Google local search is crucial. It was true in the past, it will be true in the future. if you do not understand what Google local search is and why the local search results matter so much, this article is exactly for you. Google’s new local algorithm has kicked local search up a notch of selectivity and precision. Here’s some basics you need to know about the new version of the Google local search scheme. In July 2014, Google launched a new local search algorithm. Google caused disquiet in the local SEO realm with a new version of algorithm that radically changed some local results and the way they process and perceive locality keys. Google announced that Pigeon developed tighter links between the local algorithm and central algorithm(s). Searching Google and searching Google Maps has often generated very different results. This changed after the emergence of Pigeon. The new calculation scheme links web search and map search in a more united approach. Altered local results stemming from the recently introduced Pigeon algorithm appear to be closer to the page rankings of the Google web search. This version of the algorithm connects local results more deeply to conventional web ranking cues. The refreshed local search algorithm goes deeper into the site’s web search potential, taking in account a lot of ranking cues, together with search options like spelling correction functions, synonyms and Google’s knowledge graph. In 2014 Yelp accused Google of seemingly ignoring the giant local review site in its search listings. The former claimed that Google forces its own reviews on the top of the SERP instead of Yelp’s, even when the person who created the query searched particularly for “yelp” as it can be seen in his request. Pigeon has solved the issue, and now places Yelp-intended requests in front of its own. Yelp isn’t the only lucky local review site that got a lift. Website like Urbanspoon, OpenTable, TripAdvisor, Zagat, Kayak, etc. were awarded higher recognition on SERP after the launch of Pigeon. The search requests that generate these results may be as widely formulated as [new york mall] — put differently, the searchers may not have an intention to looking particularly for reviews or review portals. In essence, this conveys the idea that the search calculation scheme gives more value to directories and the directory listings. In the local search realm, neighborhoods are known as “informal space,” suggesting there are no traditional rules here. So the understanding of where a neighborhood starts and stops can differ greatly. This becomes a real hindrance for search engines to implement the neighborhood concept properly. The search scheme will provide better results for search requests that use both the conventional way of describing some location and the colloquial way of referring to it. A certain district can be called a few different ways. It hangs on who are these people. Some foreign tourist may come to a new area and refer to it as “Uptown,” just like his map prompts him. But a local may think, “‘Uptown’? Never heard of it. It is known as ‘Trackville.’” Two different ways of naming one thing. One neighborhood. What is the correct one? With the new version of the algorithm, both are correct. The search will now return local results for neighborhoods that are a little bit distanced from a looked-for local territory. Imagine you’re in a town area searching for a library. You turn out to be almost on the “border” of another district as indicated by the maps. You don’t care that on the map your neighborhoods are divided by a distinct border; for you the borders are blurry here and all you want is a book to read. So, even if you put a query to a search engine “East end library,” Google might return a search result that is very close to East End, but not exactly East End. This is the sort of non-determined explicitness and neighorhood-focused sixth sense that Pigeon looks like to be centered on. The scheme will provide more weight to local companies that have locality-based keywords and referrals. If businesses want to improve their Google ranking, they should focus on optimizing of their social networks’ accounts, website keywords to reflect their particular area in a district of a city or a region, not just the name of that city, own, village or region. If you do not have a lot of experience with local search engine optimization, let it do the SEO company who has mastered the technique of hyperlocal keyword research and optimization. Seomall de-mystifies SEO and helps other companies get recognition and weight in Google search results. If you want that your business website appears at the top of the search results, contact Seomall specialists who will use all their experience in SEO to help you.